In Off Beat, nerdy and brilliant Tory Blake lives with his mom in New York and leads a boring every-day-high-school life until the mysterious Colin Stephens moves in across the street. Colin lives with a non-relative guardian and commutes to St. Peter’s Academy, a distant Catholic prep school. Fascinated by his new neighbor and suspicious that Colin is hiding something, Tory begs his mom to enroll him at St. Peter’s so he can launch an investigation. As the mystery of Colin Stephens unfolds, Tory must eventually ask himself why he is so curious about this other boy, a boy who makes him blush whenever they cross paths. 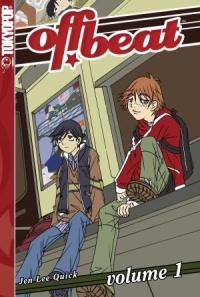 This manga is a suspenseful page-turner and a compelling teen drama. All the characters are authentic, complex, and hilarious. At the heart of the story is Tory and Colin’s multi-layered and slowly-built relationship. In addition, scenes with fully-realized side characters make this manga really come to life. For example, due to stress and fatigue, Tory and his single mom live under a never-ending sense of tension that erupts in occasional fights. Despite this, they share quiet moments of tenderness, and Tory subtly expresses desire for a better relationship with his mother. In addition, Tory’s college-student neighbor routinely comes begging for food, and the two boys have a tempestuous, bickering friendship. Once in a while, however, the two young men show concern for one another, but of course they remain too prideful to overtly acknowledge that they care how the other feels. (Oh, how I detest the painful and isolating realities of masculine culture!) The nuances of Tory’s various relationships are revealed with sensitivity, depth, and realistic detail, making each scene a relevant and meaningful read. Off Beat is composed of three volumes. This manga is delightful and I would have felt comfortable reading it at any age. Review by Aaron Walsh. Add your review of any or all of the volumes of "Off Beat" in comments!